View cart “Multi flower selections” has been added to your cart. 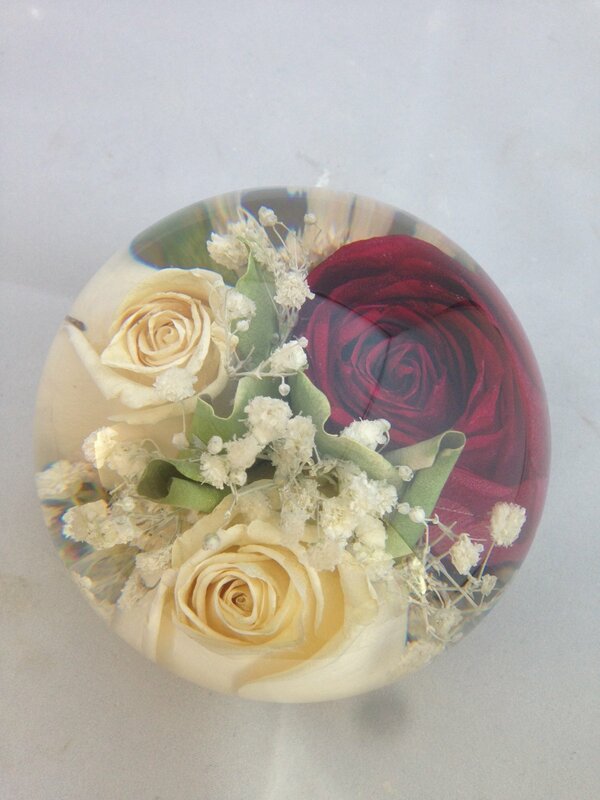 A really stunning 4.5″ size of paperweight which can enclose a really lovely assortment of more open flowers which really capture the essence of the flowers within the tribute. Enclosing a beautiful combination of the flowers and foliage supplied. 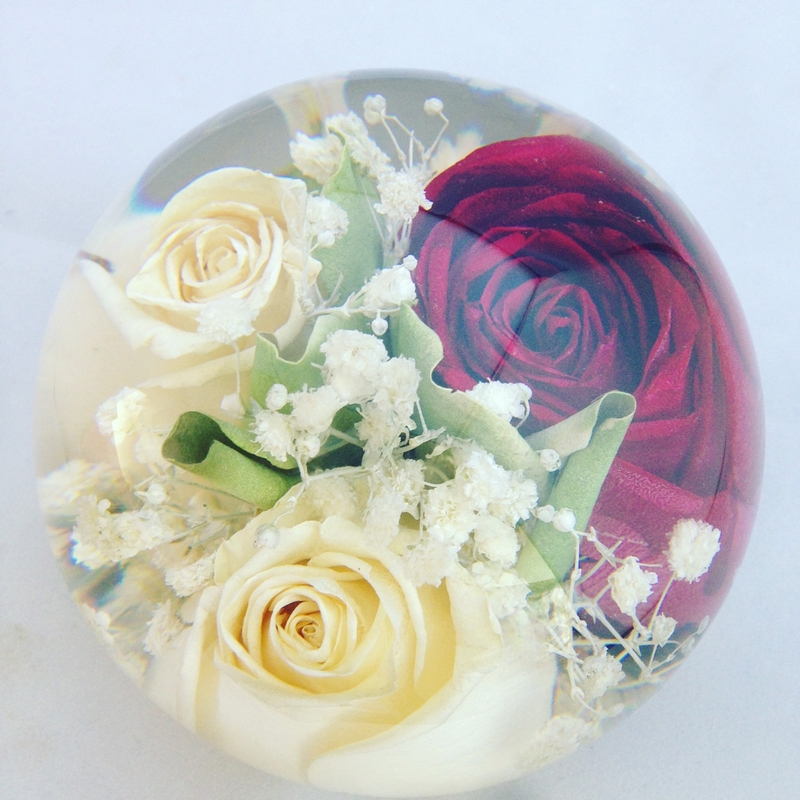 O​ur most popular ​luxurious paperweights are these beautiful 4.5″ paperweights which are approx. 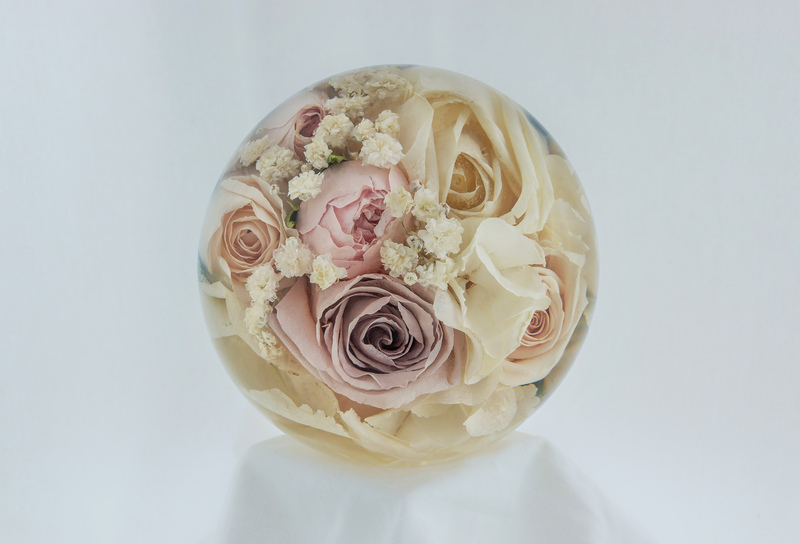 1″ wider all the way around ,but can contain up to a further 50% more flowers in this size of p/weight than the 3.5″ designs. 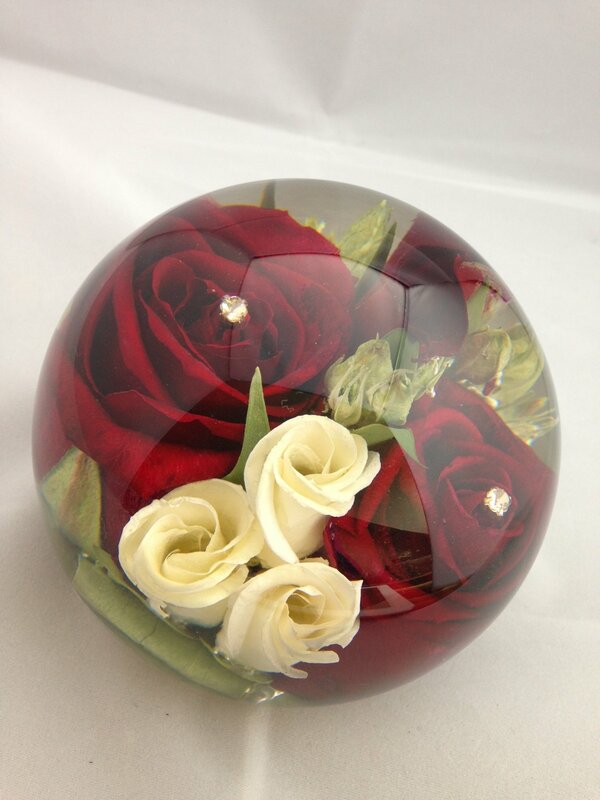 ​With the assorted flowers sent to us, we will at the designers discretion, design a lovely paperweight for you enclosing a lovely array of assorted flowers supplied. 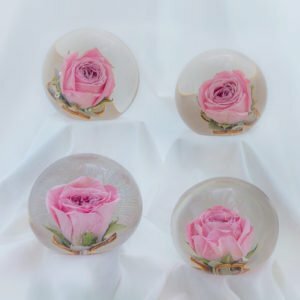 The finished paperweight will be approx 4.5″ when completed and the images here are a guide of how some paperweights have been designed. 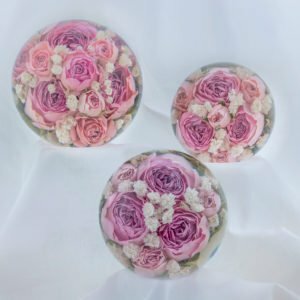 As your flowers may be different to the images , we will create a bespoke hand made paperweight just for you enclosing your lovely array of flowers. 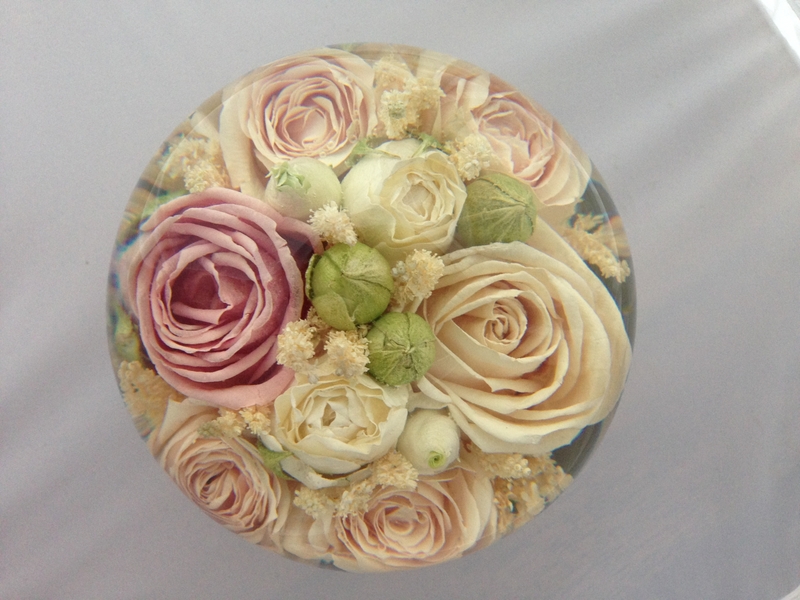 I’ve just received my flower orb and absolutely love it! Thank you so much for everything, communication and product were/are excellent! I’ve attached a pic of it, gorgeous! 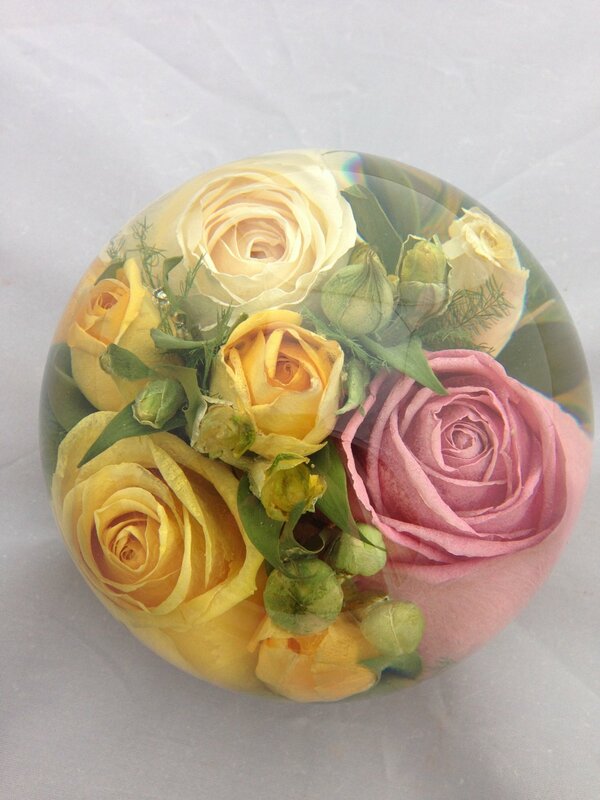 Thank you so much for my beautiful paperweight! I absolutely love it. I just want to say a huge thankyou! My pepper weight is absolutely beautiful ❤️ I’ve given feedback on Facebook, instagram and twitter as I am so pleased with it. The packaging is also beautiful and such a thoughtful touch!! I will be recommending you to everyone I know. 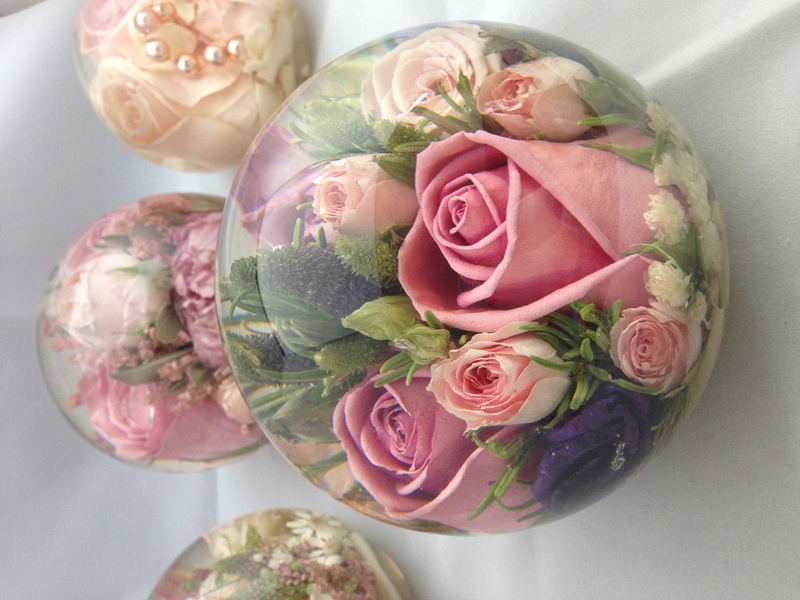 Hi Rachael just to let you know that I collected the paperweights today from the parcel depot . 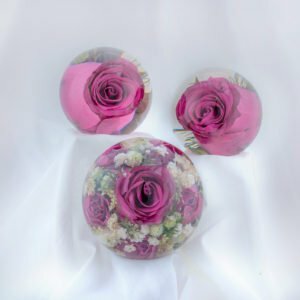 They are absolutely beautiful and I am sure both The bride and my granddaughter will also love them. Kind regards Pam. Thank you so much for your very prompt service. The paperweight actually arrived today and I am absolutely thrilled with it. I am seeing my daughter tomorrow and know she will be delighted too. 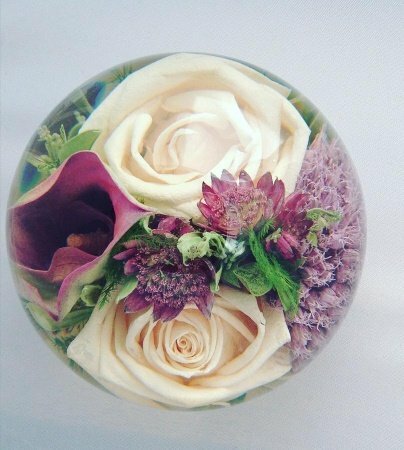 Such a lovely way to preserve part of her wedding bouquet. Absolutely beautiful, can’t thank you enough. 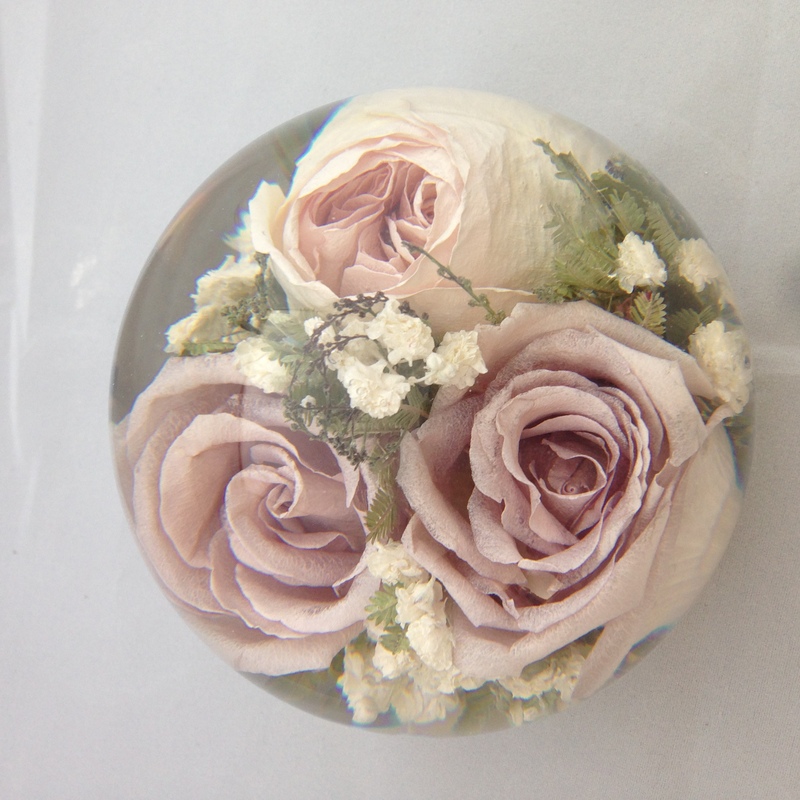 Belatedly, thank you for the beautiful paperweight preserving my daughter-in-law’s wedding bouquet: it is really lovely and I am delighted with what you have managed to achieve with it. It came in the mail this weekend! It is one of the most beautiful things I now own!! Thank you to the entire team, amazing work! The two paperweights have arrived safe and sound this morning. They are absolutely lovely and I am so pleased I made the decision (all those months ago) to have them made. 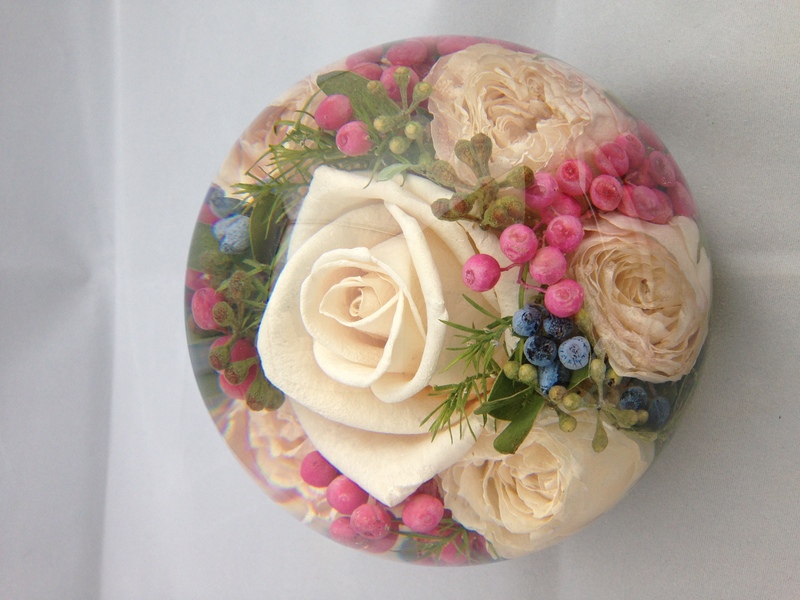 Shame about the orchids in Mum’s funeral bouquet – the paperweight from the roses is still beautiful and a lovely memory. I hope you are all having a well earned break over the holidays. All received and we love it, thank you so much!! 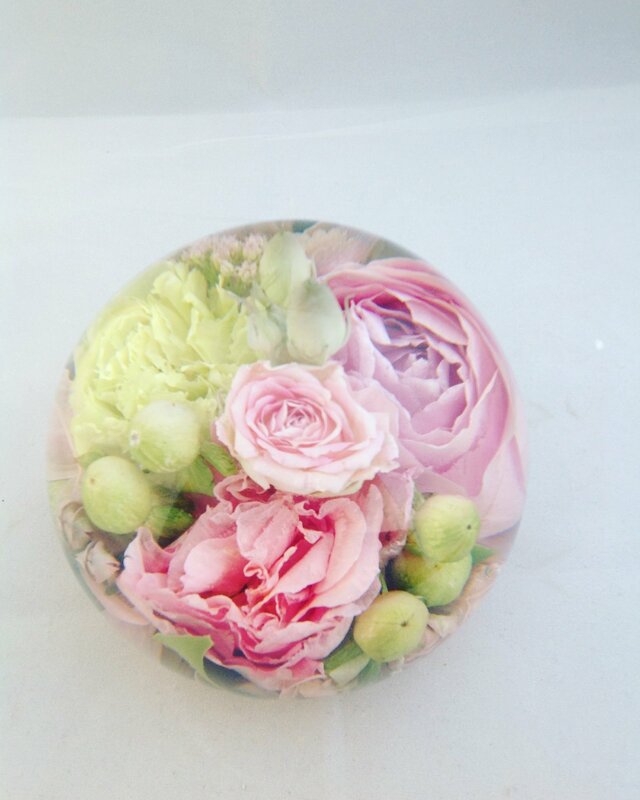 Sorry for the late reply but I just wanted to say a massive thank you for my flower paper weight. It is amazing and so happy with it. 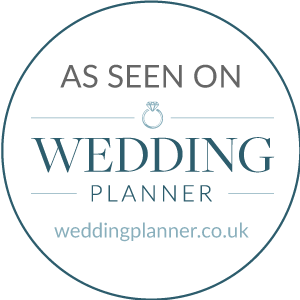 My family are all very impressed with the final result and would highly recommend your company to future bride. All received safe and sound! I am delighted thank you. Just wanted to say a massive *thank you*!!! for the paperweights. They arrived on time on Thursday so I was able to give them out at the wedding on Friday and they are the most beautiful things!!! Everyone loved them and they really matched the bouquets and buttonholes we had. 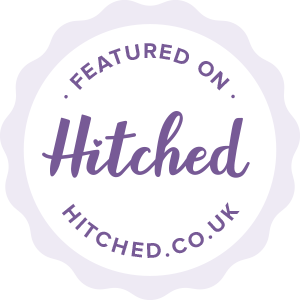 You guys are amazing and you dealt with me and all my stressy emails in a really professional and friendly way too… I am very impressed!! I shall certainly be recommending you to everyone! Thank you again for all your hard work and arty expertise!! Beyond ecstatic with is delivery today , even had a little tear in y eye when l opened it up ! My beautiful wedding flowers , thank you so much. 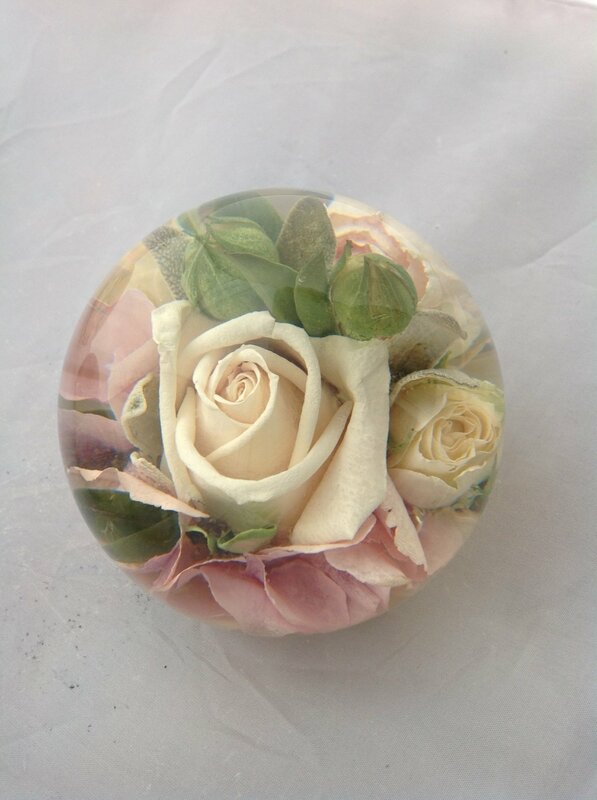 I just wanted to let you now how thrilled I am with the finished paperweight, I bought it as a surprise Christmas present for my daughter and new son-in-law and I know they will love it, they still think their wedding flowers went on the compost heap! So I’ll wait until the New Year to put some feedback on Facebook etc rather than now. 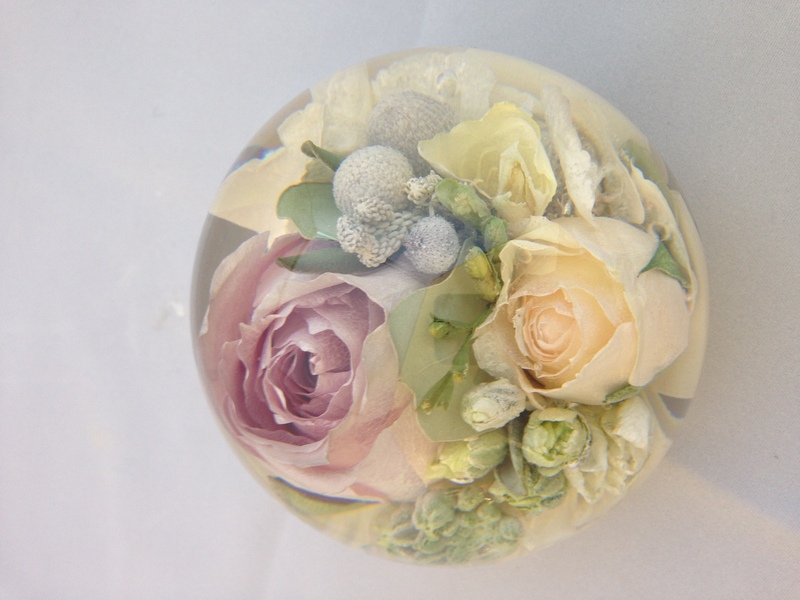 My paperweight has just arrived and it is absolutely stunning!!! I am so, so pleased, the quality of the flowers is amazing. Thank you all so, so much. I can’t wait to give it to Emily on Christmas morning. 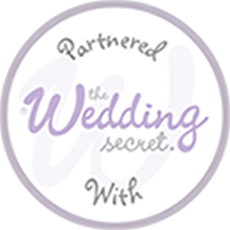 Thank you all for providing such a wonderful gift that will be an everlasting memory of my daughter’s beautiful wedding day. Something for her to treasure forever! Just a note to say thank you! 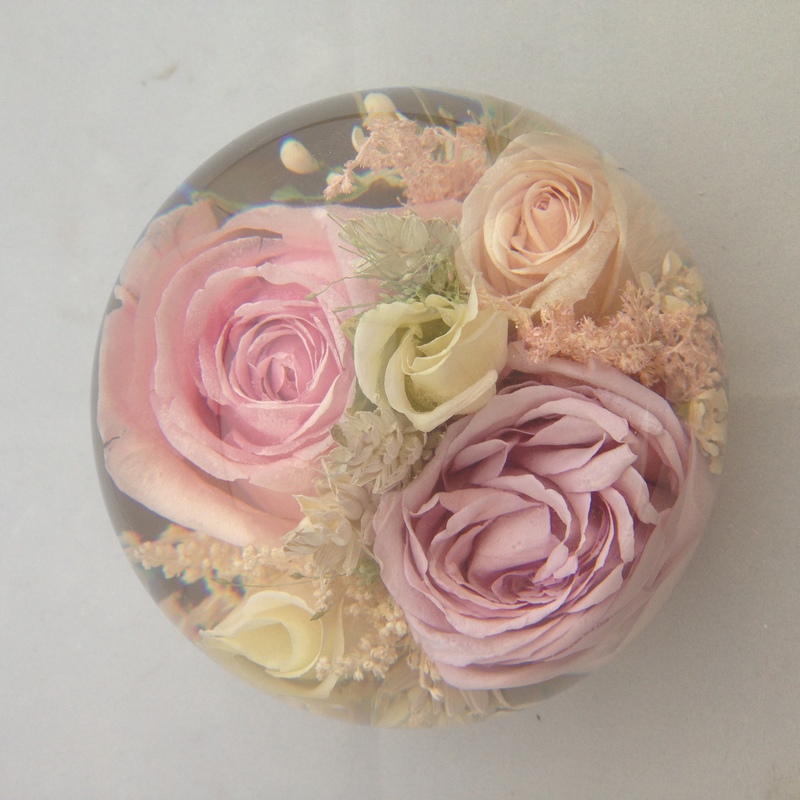 I picked up my paperweight from the post office at the weekend and it’s absolutely worth the wait. The colours are wonderful and the design is perfect.The chocolates were a lovely surprise as well. Thank you for your help and patience with the delay and I’ll certainly be recommending you to my friends and family. Just want to say how much I ❤ what you have done with my bouquet. Hoping this will become something to pass down to future generations . Thank you so much! Just to let you know that the paperweight has arrived. It’s beautiful and I’m sure my daughter will be thrilled with it. She’s just about to have a baby, so it has come just at the right time to present after the birth. My apologies that this is a little late but I wanted to say a big thank you for the lovely presentation of Laura’s flowers. She loves the paperweight! 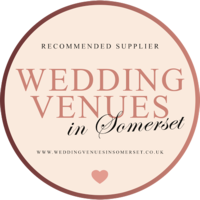 Having shared a picture on the usual social media it has certainly been ‘liked’ and ‘loved’ a lot, and will hopefully be a small form of advertising for you. 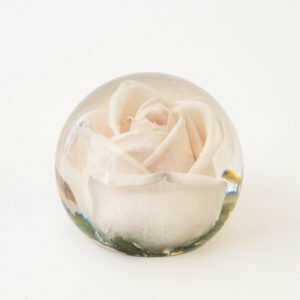 The paperweight was definitely worth the wait – thank you very much for your help! Thank-you so much it’s extraordinary. The flowers look flawless, so much detail. A perfect reminder of our wedding day. I just wanted to say my keepsake arrived promptly on Tuesday and it is beyond my expectations. I can’t thank you enough for creating such a wonderful ornament to symbolise my memories of that special day! The craftsmanship really is incredible. I received my paperweight today. After months of waiting and excitement my expectations over this period of time heightened. I am truly delighted with this beautiful keepsake!! I cannot wait to give them this lifelong memento and to see their faces when they open it!! I have just received my flowers, all I can say is WOW! I am in love with them all over again!! Thank you so much!! I am over the moon with them! !